We are MICHAEL AND HEATHER SMURTHWAITE, and we so enjoyed our senior mission in Guatemala from 2005 – 2007, that we wanted to share through the web the music materials we developed there. Michael also composes and arranges songs, and we decided to include those in the English section of the website. 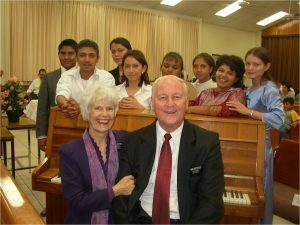 The Smurthwaitesong website offers free-of-charge music and basic music training materials in both Spanish and English, designed to enhance the worship within the homes and ecclesiastical units of the Church Jesus Christ of Latter-day Saints. Also available is a variety of music for general purposes to be enjoyed by any musician or musical group. A) Simplified hymns and Primary songs in the same key as the original in order to assist emergent piano players to learn to first play and accompany, and later transition into playing from the regular hymnbook and Primary songbook. B) Simplified piano and music-conducting lesson manuals in Spanish with lesson plans, developed for use in homes, wards and stakes in countries where music education is not offered routinely to the school children or general public. The music-training presentations are based on the Church music handbook so that stake and ward music committees may use the instructions on how to organize a piano or music-conducting class in each stake. C) Hymn arrangements, solos, duets, and quartets music created for the use of stake or ward choirs in both English and Spanish-speaking countries. Arrangements for Spanish-speaking countries are necessarily simplified much more so than for English-speaking countries with more extensive experience in Church music. D) Interestingly, for parents of young children, the website also presents bilingual quiet booklets in English and Spanish created originally by the very experienced Virginia Cazier, which present the basic principles of the Gospel in simplified language. We hope these offerings will help increase the music abilities and appreciation of many Latter-day Saints. Since music increases the influence of the Lord in all worship, we also hope these songs will help transfer joy and faith to the rising generation– which includes our children, grandchildren and great-grandchildren.